When it comes to decorating, you may think that more space means more opportunities. In truth, a small space can actually offer tons of interesting design opportunities when you think creatively and cleverly. A small kitchen is a great example of this. While it may be short on storage or surface space, its style can be abundant. 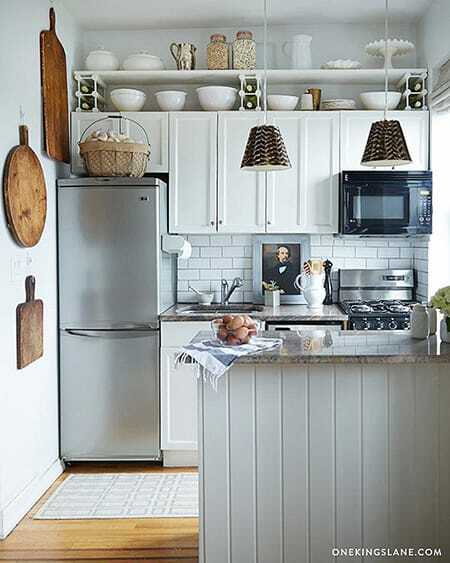 There are plenty of ways to make a small kitchen look incredible. You won’t even notice the limited square footage because you’ll be so taken with the charm and character of the space. And as far as surface and storage space goes, there are hacks to increase those, as well, when you get clever with the layout. 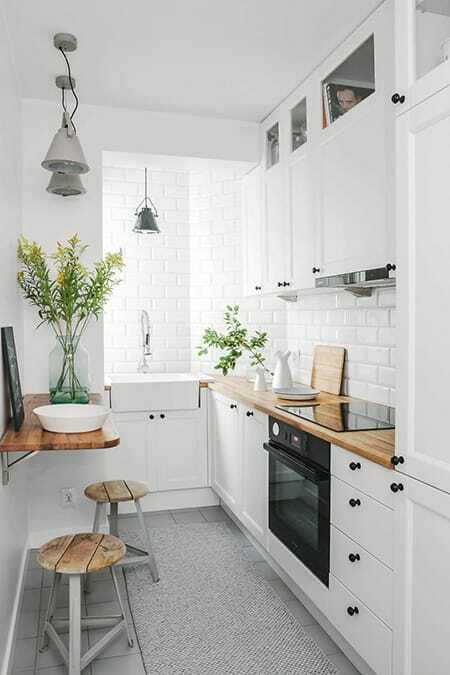 Here are 10 stylish small kitchens to give you some ideas and inspiration on how to make the most of the space. 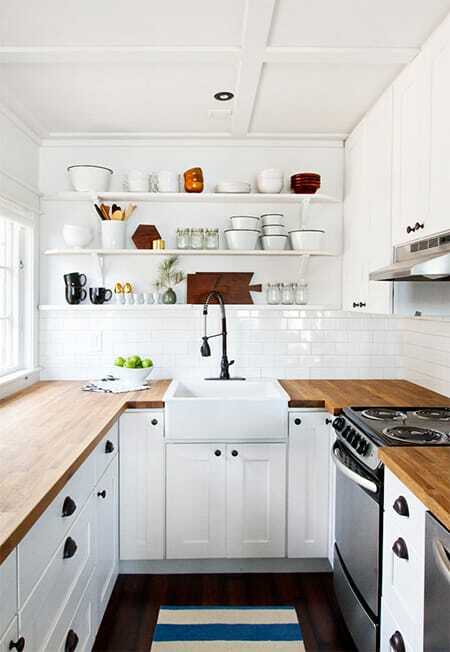 This kitchen may be small on space but it’s got a ton of charm. The hanging cutting boards are a nice touch! A soft grey on the cabinets creates some depth while still keeping things bright and open. One wall of open shelving adds some variety to the space and opens it up a bit. The hanging table was a smart way to make use of the space and provide an extra surface for both cooking and dining. 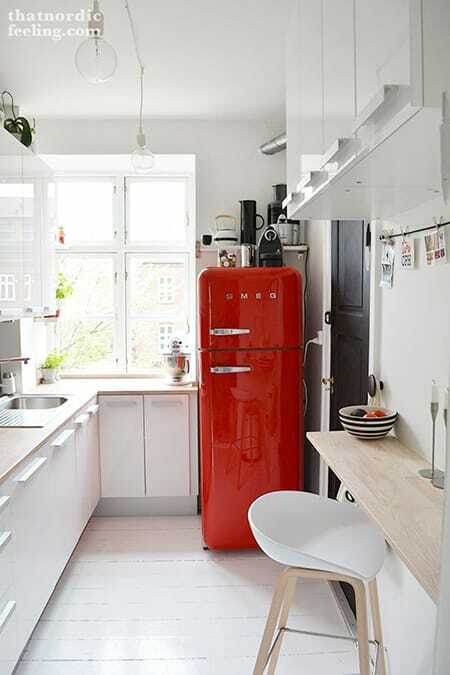 The pop of red on the vintage-style refrigerator adds a punch of personality to this modern white kitchen. 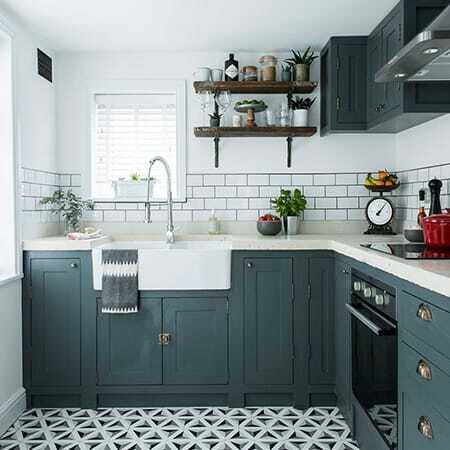 Blue cabinets, geometric floor tiles, and a subway tile backsplash turn this small kitchen into a charming corner. Love black and white? 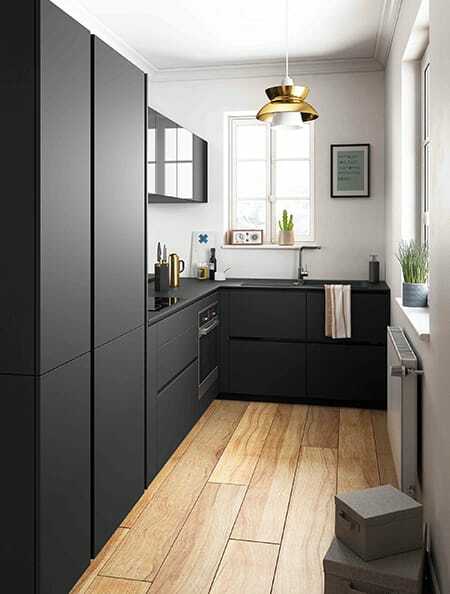 These streamlined matte black cabinets definitely make a statement! 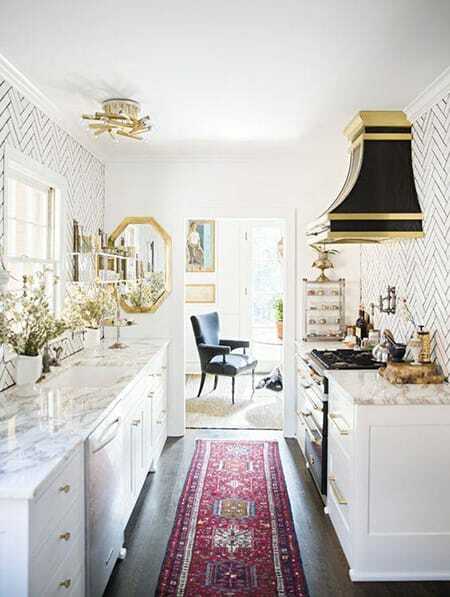 Several beautiful elements make this small galley kitchen into a glamorous haven. Who said you can’t go bold and dramatic in a small kitchen? 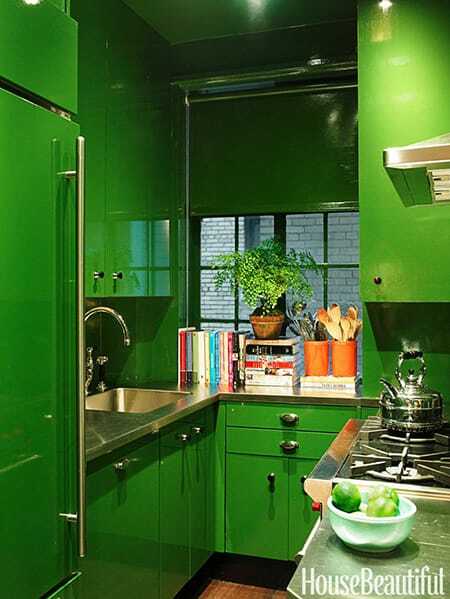 These high gloss green cabinets prove anything is possible! 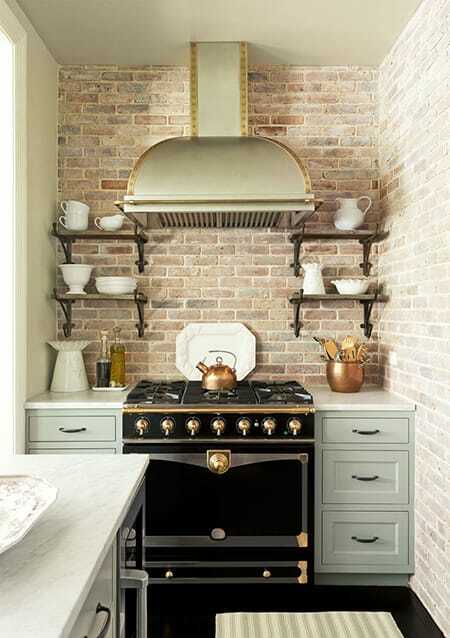 How charming is this kitchen full of vintage elements and brick accent walls? 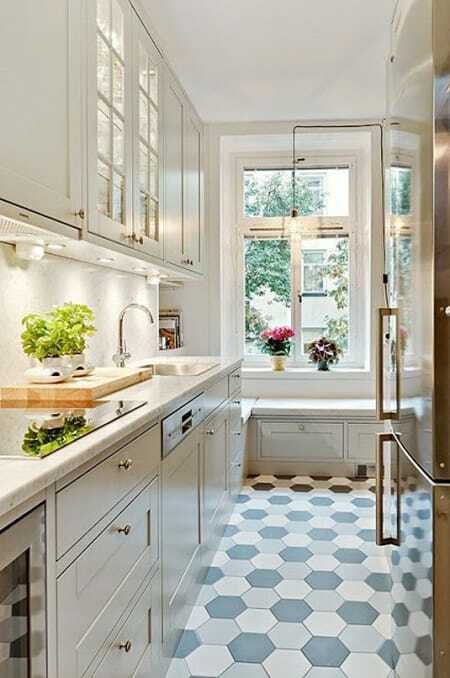 Even a small kitchen can be packed with a ton of style when are clever with the design.